Today was a long day but certainly a good one. We drove from Morro Bay to San Francisco via the PCH with some stops along the way in Big Sur, Pacific Grove, and Big Basin State Park. Pretty spectacular views along this journey. We have driven from LA to Monterey before and it was quite foggy, so we didn’t do too many other stops along the PCH. 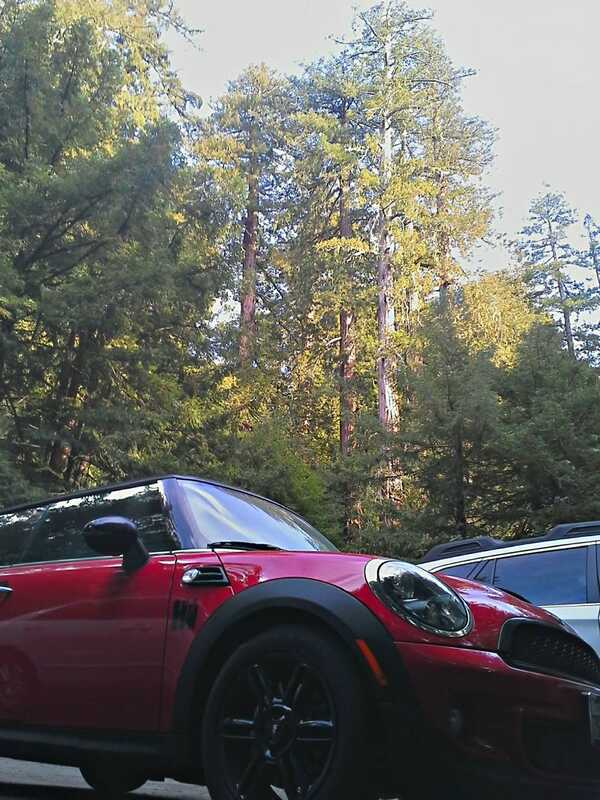 We made record time, around 2 hours to get to Big Sur. Thankfully no RVs hogging the corners and really nobody at all out on the road. We left around 730 and it’s a Friday, so traffic didn’t amp up until well after Big Sur. In the park, we spent some time at Pfeiffer Beach. Quite the treacherous road to get down there, the suspension in the Mini had fun beating us up! Although it was a short stop, after Bug Sur we spent some time at the Monarch Sanctuary in Pacific Grove. Naturally my sweet girlfriend posed for a picture in the butterfly they had out front. Quite a cool little place to walk around and see so many butterflies fluttering around. The next excursion on the way to San Francisco was Big Basin Redwood State Park. The roads to get up there were a little crazy but much of it was pretty fun. I do not trust the front tires on this car at all so I’m not pushing it too hard. But it’s still quite fun and I saw quite a few other fun cars driving around up there. These trees are just so massive! I’ve certainly seen pictures of Redwood trees before but seeing it in person gives a new perspective to it. Really reminds me of how tiny humans are and what a wonder nature is. After more crazy narrow roads and a bit of traffic on interstate 280, we made it to our airbnb for the next few days. We are staying in Bernal Heights which is quite the hilly neighborhood! Driving up these Hills, I just imagined what it would be like on a bicycle or if it was somehow icy. I’ve also discovered that the Mini is equipped with Hill hold assist. That is like some voodoo black magic and really gets in the way when you aren’t aware of it. I actually stalled the car once because of not knowing what was going on with that feature. Anyways, tomorrow will be a fun day of exploring the city mostly by car. Last year we had visited for about a week. That time we used public transit solely and it worked well. But this time we are curious what driving around will be like. At least until dinner time, then we will probably park back at the place and take the Bart back into the city.